Modood, T. (2018 advance online) ‘Interculturalism: Not a New Public Policy Paradigm’, Comparative Migration Studies (a Symposium Rejoinder). Modood, T. (2017) ‘Intercultural Public Intellectual Engagement’, Journal of Citizenship and Globalisation Studies. 1(1): 36-47. Modood, T and S. Thompson, (2017) Revisiting contextualism in political theory: putting principles into context, 12 April, Res Publica - A Journal of Legal and Social Philosophy. 1-19. Khattab, N. and Modood, T. (2017, ‘Accounting for British Muslim’s educational attainment: gender differences and the impact of expectations’, British Journal of Sociology of Education, 1-18, 11 April. Tariq Modood interviewed by Simon Thompson, 'On being a public intellectual, a Muslim and a multiculturalist', Renewal, April, 24 (2): 90-95. ​Modood, T. (2016) ‘What is Multiculturalism and what can it learn from Interculturalism’ in ‘Interculturalism versus Multiculturalism – The Cantle-Modood Debate’ in Ethnicities, OnlineFirst. Download here. Khattab, N. and Modood, T. (2015) ‘Both Ethnic and Religious: Explaining Employment Penalties across 14 Ethno-Religious Groups in the UK’, Journal of the Scientific Study of Religion, 54(3), pp. 501-522. Download here. Meer, N. and Modood, T. (2015) ‘Religious pluralism in the United States and Britain: Its implications for Muslims and nationhood’, Social Compass, 62(4), pp. 526-540. Download here. Modood, T. & Khattab, N. (2015) 'Explaining Ethnic Differences: Can Ethnic Minority Strategies Reduce the Effects of Ethnic Penalties? ', Sociology, early online. Download here. 17(2), pp. 189–206. Download here. Stephen H. Jones, Therese O'Toole, Daniel Nilsson DeHanas, Tariq Modood and Nasar Meer (2015) A ‘System of Self-appointed Leaders’? Examining Modes of Muslim Representation in Governance in Britain', British Journal of Politics and International Relations, vol, 17(2), pp. 207–223. Download here. Modood, T. (2015) Review of Yolande Jansen, Secularism, Assimilation and the Crisis of Multiculturalism: French Modernist Legacies, Ethnicities. Download here. Review O'Toole, T., Meer, N., DeHanas, D., Jones, S. & Modood, T. (2015) ‘Governing through Prevent? Regulation and contested practice in state-Muslim engagement’, Sociology. Download here. Dobbernack, J. & T. Modood (2015) ‘What is important in theorizing tolerance today?’ Contemporary Political Theory. Download here. Modood, T. (2014) ‘Multiculturalism, Interculturalisms and the Majority’, Kohlberg Memorial Lecture, Journal of Moral Education, 43(3): 302–315. Download here. Modood, T. (2014) ‘Hate speech: The feelings and beliefs of the hated' in ‘Understanding and regulating hate speech: A symposium on Jeremy Waldron’s The Harm in Hate Speech’, Contemporary Political Theory, 13, 104–109. Download here. Meer, N. & Modood, T. (2014) 'Cosmopolitanism and integrationism: Is multiculturalism in Britain a zombie category? ', Identities: Global Studies in Culture and Power, 21(6), pp. 658-674. Download here. Noden, P., Shiner, M. & Modood, T. (2014) 'University offer rates for candidates from different ethnic categories', Oxford Review of Education, 34(3), pp. 349-369. Download here. Dobbernack, J., Meer, N. &Modood, T. (2014) 'Misrecognition and political agency: The case of Muslim organizations in a General Election', The British Journal of Politics and International Relations, 17(2), pp. 189-206. Download here. Martínez, D.O. (2013) ‘Intellectual biography, empirical sociology and normative political theory: An interview with Tariq Modood’, Journal of Intercultural Studies, 34(6), pp. 729-741. Download here. Modood, T. (2013) ‘Accommodating religions: Multiculturalism’s new fault line’, Critical Social Policy, 34(1), pp. 121-127. Download here. Modood, T. (2013) ‘The fault lines of multiculturalism: A rejoinder’ in Critical Social Policy, 34(1), pp. 3135-139. Download here. Meer, N. and Modood, T. (2013) 'Beyond "methodological Islamism"? A thematic discussion of ‘Islamic’ immigrants in Europe', Advances in Applied Sociology, 3 (7): 307-313. Download here. Modood, T. (2013) ‘Political blackness and British Asians’ (reproduction of 1994 article) in Meer, N. and Nayak, A. (eds.) Race Ends Where? e-special issue of Sociology. Download here. Uberoi, V. and Modood, T. (2013) ‘Has Multiculturalism Retreated in Britain?’, Soundings. Download here. Uberoi, V. & Modood, T. (2012) ‘Inclusive Britishness: A Multiculturalist Advance’ Political Studies, 61(1), 23-41. Download here. O’Toole, T., DeHanas, D. & Modood, T. (2012) ‘Balancing tolerance, security and Muslim engagement in the United Kingdom: the impact of the ‘Prevent’ Agenda’, Critical Studies on Terrorism, 5(3), 373-289. Download here. Modood, T. (2012) '2011 Paul Hanly Furfey Lecture: Is There a Crisis of Secularism in Western Europe?’, Sociology of Religion, 73(2). Download here. Modood, T. & Meer, N. (2012) ‘Assessing the Divergences on Our Reading of Interculturalism and Multiculturalism’, Journal of Intercultural Studies, 33(2). (Reply to P. Werbner, W. Kymlicka, G.B. Levey and M. Wieviorka.) Download here. Meer, N. & Modood, T. (2012) ‘How does Interculturalism Contrast with Multiculturalism?’, Journal of Intercultural Studies, 33(2). Download here. Modood, T. (2012) 'Differenz und Integration', Forschungsjournal Neue Soziale Bewegungen, 12(1). Download here. Modood, T. & J. Dobbernack (2011) ‘A Left Communitarianism? What about Multiculturalism?’, Soundings, 48. Download here. Khattab, N., Johnston, R., Modood, T. & Sirkeci, I. (2011) ‘Economic Activity in the South-Asian Population in Britain: The Impact of Ethnicity, Religion and Class’, Ethnic and Racial Studies, 34(9). Download here. Shah, B., Dwyer, C. & Modood, T. (2010) 'Explaining Educational Achievement and Career Aspirations Among Young British Pakistanis: Mobilising 'Ethnic Capital'? ', Sociology, 44(6). Download here. Meer, N., Dwyer, C. & Modood, T. (2010) ‘Beyond "Angry Muslims"? Reporting Muslim Voices in the British Press’, Journal of Media and Religion, 9(4). Download here. Modood, T., Patel, P., Bard, J., Omoniyi, T., Fishman, J. & Gutkowski, S. (2010) 'From Multiculturalism to Multifaithism? : A Panel Debate', Studies in Ethnicity and Nationalism, 10(2). Download here. Smetherham, C., Fenton, S. & Modood, T. (2010) ‘How Global is the UK Labour Market?’, Globalisation, Societies and Education, 8(3). Download here. Modood, T. (2010) ‘Multicultural Citizenship and Muslim Identity Politics’, Interventions, 12(2), in special issue, ‘Muslims in the Frame’. Download here. Modood, T. (2010) 'Säkularismus, Religion als Identität und die Achtung der Religion', Transit, 39. Uberoi, V. & Modood, T. (2010) ‘Who Doesn’t Feel British? Divisions Over Muslims’, Parliamentary Affairs, 63(2). Download here. Johnston, R., Sirkeci, I., Khattab N., and Modood, T. 2010. Ethno-Religious Categories and Measuring Occupational Attainment in Relation to Education in Englandand Wales: A Multi-Level Analysis. Environment and Planning A, 42(3). Download here. Khattab, N., Johnston, R., Modood, T. & Sirkeci, I. (2010) 'The Impact of Spatial Segregation on the Employment Outcomes Amongst Bangladeshi Men and Women in England and Wales', Sociological Research Online 15(1). Meer, N., Dwyer, C. & Modood, T. (2010), ‘Embodying Nationhood? Conceptions of British National Identity, Citizenship and Gender in the "Veil Affair"', The Sociological Review, 58(1). Download here. Modood, T. (2010) ‘Moderate Secularism, Religion as Identity and Respect for Religion’, Political Quarterly, 81(1). Download here. Modood, T. (2009) ‘Introduction: Odd Ways of Being Secular’, Social Research, 76(4), Special Issue on The Religious-Secular Divide. Download here. Meer, N. & Modood, T. (2009) 'The Multicultural State We Are In: Muslims, "Multiculture" and the "Civic Re-balancing" of British Multiculturalism', Political Studies, 57(3). Download here. Meer, N. & Modood, T. (2009) ‘Refutations of Racism in the ‘Muslim Question’, Patterns of Prejudice, 43(3-4), Special Issue on Islamophobia. Download here. Levey, G. & Modood, T. (2009) ‘The Muhammad Cartoons and Multicultural Democracies’, Special Issue on the Danish Cartoons Affair, Ethnicities, 9(3). Download here. Modood, T. (2009) ‘Multicultural Equality, Liberal Citizenship and Secularism’, Journal for the Study of British Cultures, 16(2). Download here. Kyriakides, C., Virdee, S. & Modood, T. (2009) 'Racism, Muslims and the National Imagination', Journal of Ethnic and Migration Studies, 35(2). 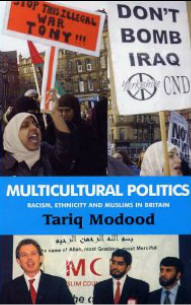 Download here.Modood, T. (2008) 'Multicultural British Citizenship and Making Space for Muslims', Cycnos. Modood, T. (2008) ‘Multiculturalism and Groups’, Social and Legal Studies, 17(4). Part of a Review Symposium on T. Modood, Multiculturalism: A Civic Idea, 2007 and A. Phillips, Multiculturalism Without Culture, 2007. Download here. Meer, N. & Modood, T. (2008) 'British Multiculturalism and her Muslims', Global Dialogue, 9 (3-4). Modood, T. (2008) ‘A Basis for and Two Obstacles In the Way of a Multiculturalist Coalition’, The British Journal of Sociology, 59(1). Download here. Modood, T. (2007) ‘Rebatir le multiculturalisme en Grande-Bretagne après less attentats du 7 Juillet 2005’, Ethique Publique, 9(1). Loury, G., Modood, T. & Teles, S. (2007) 'Ethnicity, Social Mobility and Public Policy: Comparing the US and UK', Journal of World Ethno-National Studies. Download here. Modood, T. & Ahmad, F. (2007) ‘British Muslim Perspectives on Multiculturalism’, Theory, Culture & Society, 24(2), Special Issue on Global Islam. Download here. Virdee, S., Kyriakides, C. & Modood, T. (2006) ‘Codes of Cultural Belonging: Racialised National Identities in a Multi-Ethnic Scottish Neighbourhood’, Sociological Research Online, 11(4). Modood, T, R. Hansen, E. Bleich, B. O'Leary & J. Carens (2006) 'The Danish Cartoon Affair: Free Speech, Racism, Islamism, and Integration', International Migration, 44(5). Download here. Modood, T. (2006) 'Ethnicity, Muslims and Higher Education Entry in Britain', Debate Section, Teaching in Higher Education, 11 (2): 247-250, 2006. Download here. Modood, T. (2005) 'A Defence of Multiculturalism', Soundings: A Journal of Politics and Culture. Download here. Modood, T. (2004) ‘Capitals, Ethnic Identity and Educational Qualifications’, Cultural Trends, 13(2), Special Issue on Cultural Capital and Social Exclusion. Download here. Modood, T. (2004) ‘Muslime und Multikulturalismus in Europa’, Transit, Europaische Revue, 27. Modood, T. (2003) ‘Muslims and the Politics of Difference’ in Political Quarterly, 74 (supplement 1). Download here. Berthoud, R., Nazroo, J. & Modood, T. (2002) ‘"Race", Racism and Ethnicity: A Response to Ken Smith’, Sociology, 36(2). Download here. Shiner, M. & Modood, T. (2002) ‘Help or Hindrance? Higher Education and the Route to Ethnic Equality’, British Journal of Sociology of Education, 23(2). Download here. Modood, T. & May, S. (2001) ‘Multiculturalism and Education in Britain: An Internally Contested Debate’, International Journal of Educational Research, 35(3). Download here. Modood, T. (2002) ‘Their Liberalism and Our Multiculturalism?’, Review Article, British Journal of Politics and International Relations, 3(2). Download here. Modood, T., Parekh, B. & Hall, S. (2000) ‘Review Symposium Reply on The Future of Multi-Ethnic Britain', Journal of Ethnic and Migration Studies, 26(4). Fenton, S., Carter, J. & Modood, T. (2000) ‘Ethnicity and Academia: Closure Models, Racism Models and Market Models’, Sociological Research Online, 5(2). Modood, T. (2000) ‘La Place des Musulmans Dans le Multiculturalisme Laic en Grande-Bretagne’, Social Compass, 47(1). Download here. Modood, T. (1998) 'Anti-Essentialism, Multiculturalism and the "Recognition" of Religious Minorities', Journal of Political Philosophy, 6(1). Download here. Modood, T. (1998) `Multiculturalism, Secularism and the State', Critical Review of International, Social and Political Philosophy, 1(3). Download here. Modood, T. (1996) `"Race" in Britain and the Politics of Difference' in Philosophy, Royal Institute of Philosophy Supplement. Modood, T. (1996) `The Changing Context of `Race' in Britain: A Symposium', Patterns of Prejudice, 30(1). Modood, T. (1994) ‘Political Blackness and British Asians', Sociology, 28(4). Download here. Modood, T. (1994) ‘Establishment, Multiculturalism and British Citizenship', Political Quarterly, 65(1). Modood, T. (1993) ‘Kymlicka on British Muslims' and 'Kymlicka on British Muslims: A Rejoinder', Analyse & Kritik: Zeitschrift für Sozialtheorie, 15(1). Download here. 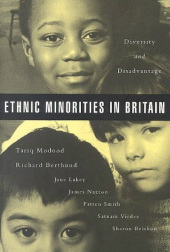 Modood, T. (1993) ‘The Number of Ethnic Minority Students in British Higher Education', Oxford Review of Education, 19(2). Download here. Modood, T. (1993) ‘Muslim Views on Religious Identity and Racial Equality', New Community, 19(3). Modood, T. (1991) ‘Les Musulmans Asiatiques de Grande-Bretagne et L'Affaire Rushdie', Special Issue on Race Relations in Britiain, Les Temps Modernes, 540-541. Modood, T. (1991) ‘The Indian Economic Success: A Challenge to some Race Relations Assumptions', Policy and Politics, 19(3). Modood, T. (1990) 'Catching Up with Jesse Jackson: Being Oppressed and Being Somebody', Journal of Ethnic and Migration Studies, 17(1). Modood, T. (1990) ‘Muslims, Race and Equality in Britain: Some Post-Rusdie Affair Reflections', Third Text, 4(11). Download here. Modood, T. (2005) ‘British Asian Muslims and the Rushdie Affair', The Political Quarterly, 61(2). Modood, T. (1989) ‘Religious Anger and Minority Rights', Political Quarterly, 60(3). Modood, T. (1989) ‘The Later Collingwood's Alleged Historicism and Relativism', Journal of the History of Philosophy, 27(1). Modood, T. (1988) ‘"Black", Racial Equality and Asian Identity', New Community 14(3). Modood, T. (1984) ‘J.L. Mackie's Moral Scepticism', Journal of Value Inquiry, 18(3). Modood, T. (1982) ‘Differences in Moral Reasoning', Philosophical Studies, 29. Hall, D. & Modood, T. (1982) ‘A Reply to Liddington', Political Studies 30(2). Download here. Hall, D. & Modood, T. (1982) ‘Oakeshott and the Impossibility of Philosophical Politics', Political Studies, 30(2). Download here. Modood, T. (1980) ‘Oakeshott's Conceptions of Philosophy', History of Political Thought, 1(2). Modood, T. (1980) ‘Platonic Justice: One or Many?' Polis, 3(1). Hall, D. & Modood, T. (1979) ‘Practical Politics and Philosophical Inquiry: A Note', Philosophical Quarterly, 20(17). Download here. Modood, T. (1979) ‘Oakeshott's Conceptions of Philosophy', Indian Journal of Political Science, 40(3).